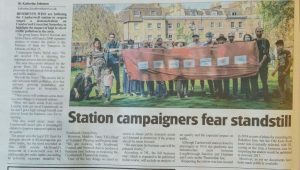 Southwark News has reported on SE5 Forum’s campaign, with local supporters, to reopen Camberwell Station in this week’s issue of the newspaper, published on Thursday 9 May. You can read the news piece in Southwark News here. 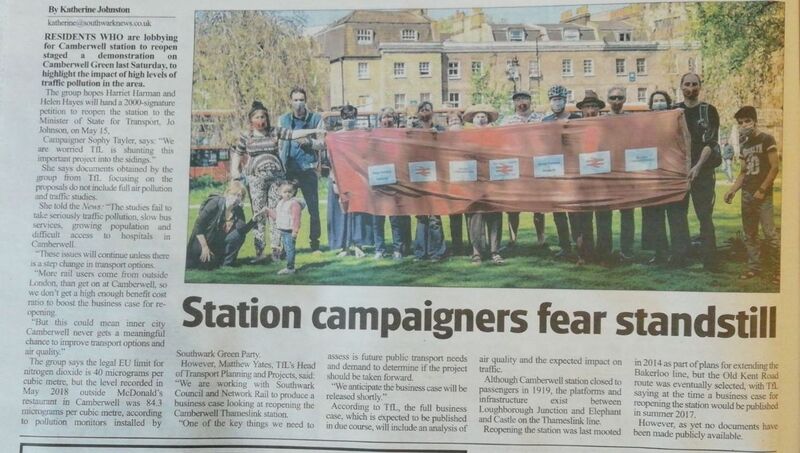 SE5 Forum organised a protest on Camberwell Green last Saturday 5 May, to highlight how reopening Camberwell Station should be part of a Cleaner Transport means Cleaner Air approach to transport and air pollution issues in Camberwell. Local supporters joined SE5 Forum campaigners to don free giveaway air pollution masks and hold up a banner demanding more to target air pollution, which is twice the EU legal limit, according to pollution monitors installed by Southwark Green Party. Changing our older buses for lower emissions models is just one small step – we need to make radical changes to SE5 transport options available to residents, and road users. SE5 Forum now has access (via a Freedom of Information request) to the background planning documents TfL is using for its business plan for the station. So far, air quality is not on the agenda. Our protest aimed to show TfL that this an important issue for Camberwell, including re-opening the Camberwell railway station. Supporters of reopening Camberwell Station donned anti-pollution masks at Camberwell Green on Saturday to highlight air pollution levels that are twice the legal EU limit in the centre of Camberwell. Traffic is a major source of air pollution in the area, and reopening the Camberwell railway station could provide a cleaner transport alternative, campaigners say. Local group SE5 Forum for Camberwell has now won access, via a Freedom of Information request, to studies showing clean air is not a priority in TFL’s analysis of the benefit of reopening the station. Campaigners will now aim to convince Minister of State for Transport Jo Johnson that using the train rather than cars and buses will improve local air quality. They are briefing local MPs Harriet Harman and Helen Hayes, who will hand a 2000-signature petition to reopen the Camberwell station to the Transport Minister on 15th May. According to SE5 Forum, the studies suggest the train service would provide a time saving of 15 minutes for those travelling from Camberwell to Elephant and Castle. Users already on the train would experience an average delay of only 42 seconds (and only on those trains that stopped at Camberwell). The study says that this change “arguably… would not be noticed by existing users”. Camberwell station sits on the Thameslink line between Loughborough Junction and Elephant and Castle. While the station last served passengers in 1919, platforms and infrastructure exist and could be re-instated. In 2014, despite a majority vote favouring Camberwell in the TfL Bakerloo underground line consultation, the route down the Old Kent Road was selected. However, the response to the consultation recommended that the business case for reopening the Thameslink station should be undertaken. In Summer 2017, Mayor of London Sadiq Khan promised that TfL’s business case would be published the autumn of that year. Now in 2018, and still with no business case in sight, campaigners made a Freedom of Information request to obtain the background documents, so as to better understand the issues. The SE5 Forum for Camberwell (se5forum.org.uk) is a grass roots community organisation, which promotes the development and improvement of Camberwell in South London. It provides a cross-borough forum in which local residents, organisations, groups and service providers can share expertise and information and work together to improve the local area. It has a track record of more than 10 years of raising the profile of Camberwell as a place in which people can live and work. The legal EU limit for nitrogen dioxide is 40 micrograms per cubic metre(μg/m3). The level recorded in May 2018 outside McDonald’s restaurant in Camberwell was 84.3 micrograms per cubic metre, according to pollution monitors installed by Southwark Green Party.